MILWAUKEE, Wis. – Badger Meter, exhibiting at AHR Expo 2017 in Las Vegas, Nev., today announced the introduction of AquaCUE® Flow Measurement Manager, an intuitive, cloud-based software platform that provides greater visibility and control over water resources in demanding sub-metering applications. AquaCUE brings a new level of optimizing information to light with targeted advanced metering analytics. The system puts interval meter data to work to address demands for actionable intelligence and improve operations. Simple and innovative, AquaCUE enables an overview of the water system virtually anywhere through a standard web browser and gives managers the information and analytics needed without the time and expense of a complicated infrastructure. The solution packages advanced software with proven flow measurement technology and leverages existing cellular network infrastructure. It delivers a powerful dashboard capability for improving management of water use, including domestic hot and cold water, irrigation systems, recreational use, tenant sub-metering, HVAC systems, and more. Rob Fehl, product marketing manager, Badger Meter, said, "You can’t manage what you don’t measure. Sub-metering throughout a facility, property, or campus empowers everyone from management to operations staff to make more knowledgeable decisions for more efficient use of valuable fluid resources. 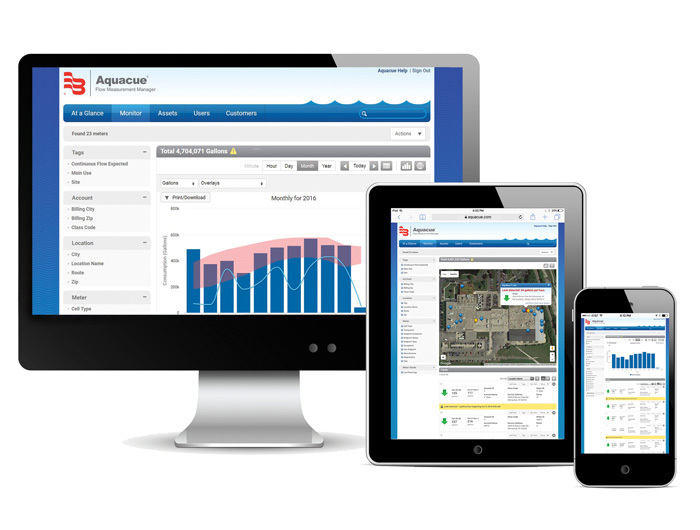 The AquaCUE software suite provides the information facility and sustainability managers need to understand and monitor their water operations, improve inefficiencies, and address equipment problems and wasteful behavior." AquaCUE’s intuitive data tools place consumption statistics at the user's fingertips, enabling rapid response to inquiries and quick resolution of issues. Cellular endpoints minimize the need for complicated infrastructure and are pre-programmed to automatically broadcast hourly meter reading and event data to the system software on a daily basis. This information helps identify potential leaks and other anomalies in water use. The customizable dashboard delivers information set per individual requirements. Alert conditions can be created to monitor and notify users of system exceptions, including continuous flow for faster leak detection. The cloud-based AquaCUE application is hosted on a secure platform with automatic software upgrades, ensuring the latest technology and features are always available. The software can be integrated with other operations and process systems via API. The system utilizes secure and robust encryption to ensure data is reliably transmitted and received; its integrity is maintained and cannot be captured or altered by unauthorized users. Certified under ISO 27001, AquaCUE meets the Service Organization Control (SOC) reporting framework for SOC 2 for data security. Long-term support and maintenance are included with the AquaCUE platform. Badger Meter is committed to working with customers from start to finish to set up their organization for success. With over 100 years of water metering experience, Badger Meter has the expertise to help determine the ideal AquaCUE configuration for your needs and train your staff on how to use the system to reap the most benefits from the powerful AquaCUE Flow Measurement Manager software. For more information about AquaCUE Flow Measurement Manager, please visit www.badgermeter.com. The AquaCUE® Flow Measurement Manager from Badger Meter.